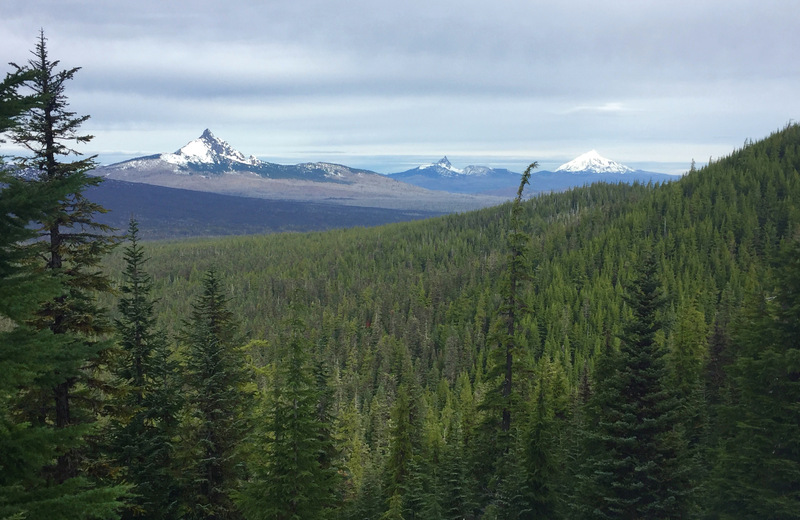 The only thing more stunning than the panoramic view of Oregon’s volcanic mountain peaks from the Dee Wright Observatory … is the view of the Sisters that smacks you right in the face as you crest the PCT near South Matthieu Lake. The observatory sits atop McKenzie Pass in the Cascade Mountains, along Oregon Highway 242 about 15 miles west of Sisters, OR. Overlooking the lava flow that poured from nearby volcanoes thousands of years ago, the observatory was built of lava rock by the Civilian Conservation Corps during the Great Depression. Towering over the lava fields — both eerie and awesome on their own — is one of the most spectacular displays of mountains in Oregon. On one side, the Three Sisters — North, Middle and South — loom. On the other side, Mt. Washington and Three Fingered Jack, among others, sit in the middle distance, while in the far distance, Mt. Hood can be seen on a clear day. The peaks of Mt. Washington, Three Fingered Jack and Mt. Jefferson can be seen from the PCT on the way to South Matthieu Lake. We began our hike on the Pacific Crest Trail that crosses the lava fields. Find that trail by going about 200 yards west of the last observatory parking lot and on the south side of the highway (the PCT does cross the road). The trail winds across the lava field — amazing in its own right — for about a mile. Shortly after leaving the lava field, the Lava Camp Lake trail meets the PCT. Take a right on the PCT to head to the Matthieu Lakes loop. In a half-mile, you’ll reach the junction of the PCT and the North Matthieu Lake trail. We followed the PCT up to South Matthieu Lake and returned on the North Matthieu Lake trail. The trail makes a steady but middling climb for about 2 miles, when you’ll see the peaks of Washington-TFJ-Jefferson to the northwest. Soon, you’ll see North Matthieu Lake below. And just a bit further, you’ll clear the trees and face the Sisters. 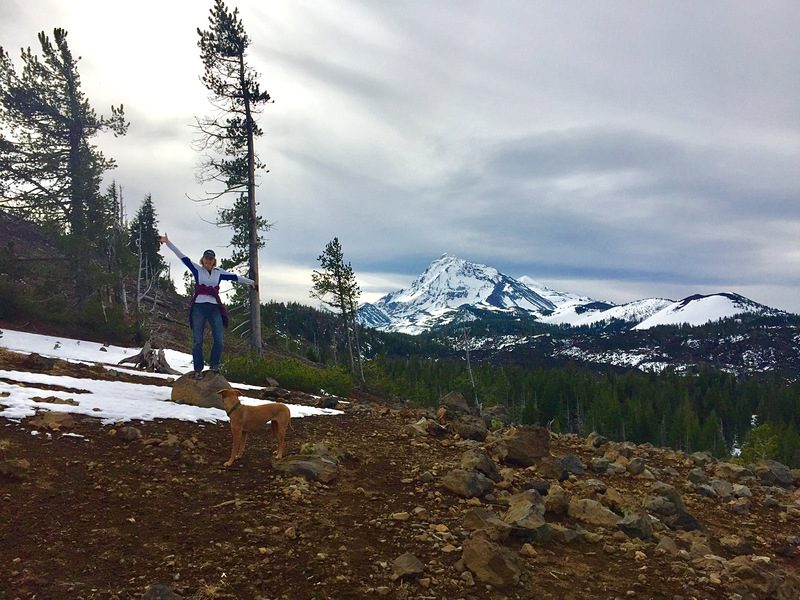 Just a bit further on the trail and left at the next junction will bring you to a stunning view of the North Sister towering over South Matthieu Lake. To reach North Matthieu Lake, backtrack to the junction and follow the North Matthieu Trail to the lake below. After exploring the lake, follow the trail back down the mountain, returning to the start of the Matthieu loop. The trail stays close to the lava flow, and on the October day when we hiked, the trail was occasionally flooded by runoff, but these spots were easily skirted. Instead of re-crossing the lava field to reach the observatory, we took a right at the PCT-Lava Lake trails junction. It was a short walk to the Lava Camp Lake trail parking lot, and a left turn returns you to Highway 242. We walked the shoulder to return to the observatory parking lot. It was cloudy the day of our hike, but the sun was burning through the clouds at the same time we were emerging, lining the ridges of the snow-dappled Sisters in bright light. Getting there: The Dee Wright Observatory is about 15 miles west of Sisters. It’s 22 miles east of the Highway 242/126 intersection — a narrow, winding climb of 4,000 feet or so — or 76 miles east of the Eugene intersection with I-5. Highway 242 is not open all year, and the narrow road is devoid of shoulders over the pass. Staying there: Several campgrounds can be found on the west side of the McKenzie Pass, most at lower elevations. But we stayed at the Forest Service’s Cold Springs Campground, just 4 miles west of Sisters. It featured pit toilets, water and cost $12 a night. Three Sisters from the trail above South Matthieu Lake.